Squaring a Circular Bowl For Fashion Jewelry creates an interesting contrast and internal design tension. The contrast of clear acrylic bowl and polished chrome base adds even more. Definitely an interesting and upscale effect overall. Fashion jewelry is by Rachel. 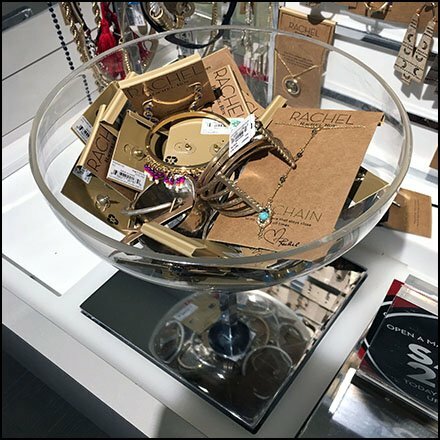 Squaring a Circular Bowl For Fashion Jewelry by Macy’s, The King of Prussia Mall, Philadelphia PA.